Rosemary contains rosmarinic acid, one of the most powerful antioxidants known. It has traditionally been used to flavor meats such as slow-cooked roasts and grilled steaks or burgers. This recipe for lemonade makes a refreshing summer beverage that can have powerful effects on your health, and it tastes GREAT! For those interested in genetics and epigenetics (the ability to regulate genetic expression which is similar to the dimmer switch on your wall for lights) here is some fascinating data compiled by Hodges and Minich.1 Rosemary can turn up (picture that dimmer switch turning up the lights) enzymes in phase 1 liver detoxification such as CYP1A1, CYP2B1, CYP2B2, CYP2C9, and CYP2D6 that really help the human body tag and get rid of harmful toxins, some of which are cancer causing. Rosemary can also turn up genes/enzymes that support phase 2 liver detoxification such as UGT (helps degrade excess estrogens and bilirubin) and GST that makes the powerful antioxidant glutathione. Rosemary can give all these genes/enzymes a big boost and improve your ability to detox and improve health. NOTE: You can look up the genes mentioned above in your raw genetic data from 23andMe, Ancestry or Family Tree DNA to see if you have SNPs in these genes. If you have SNPs this may mean you run sluggish with your ability to detox. The good news is you can use an herb such as rosemary to “turn-up” those genes and help them work better. I am happy to help you assess your genetics. Contact me for more information about a Nutrigenomics Analysis. According to Bharat Aggarwal, in his book, “Healing Spices,” rosemary may help prevent and/or treat conditions such as anxiety, arthritis, blood clots, cancer, depression, dermatitis, type 2 diabetes, gout, hair loss, heart disease, liver disease, memory loss associated with age-related mild cognitive decline, stress, stroke, ulcer, urinary tract infections and even wrinkles due to oxidative stress on the skin.2 Even wrinkles!? Pour me a glass of Rosemary Lemonade right now! Aggarwal described how the benefits of rosemary come in many forms; eating, infusions such as tea, essential oil used topically or aromatically or in supplement form. You can purchase rosemary fresh or dried. You can find it year round in either form at most grocery stores. Another option is to grow and maintain a fresh rosemary plant, but this is not required. 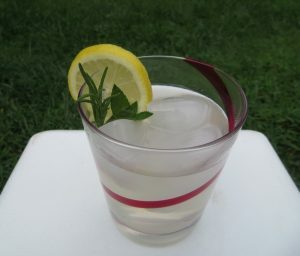 Here is the recipe so you can make your own rosemary lemonade and reap the health benefits. Benefits: This lemonade is low in sugar, a refreshing alternative to high sugar drinks and contains a powerful antioxidant. 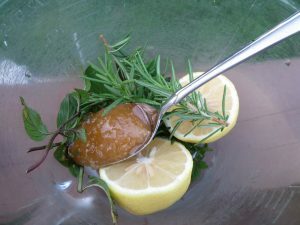 Place rosemary and mint in a heat-proof glass bowl. Using a wooden mallet or the back of a spoon bruise the herbs to help release their oils and flavors. Add the fresh juice and the whole peel of the lemon and the honey. Poor the 4 cups of boiling water over these ingredients and let steep for 15-20 minutes. Poor the lemonade through a strainer to remove the herb bits and lemon seed and peel. Discard the herbs and lemon. 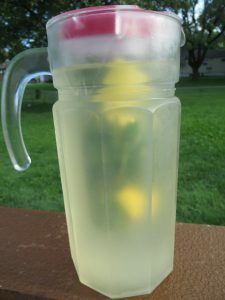 Place the strained lemonade into a glass pitcher and add the remaining 4 cups of cold water. If you have a pitcher with an infuser use your extra rosemary, mint and lemon to fill the diffuser and add a bit more flavor and eye appeal. Serve lemonade over ice with a fresh slice of lemon. TIP: I found the glass pitcher with an infuser core at the local Home Goods store for a very reasonable price (see picture below).